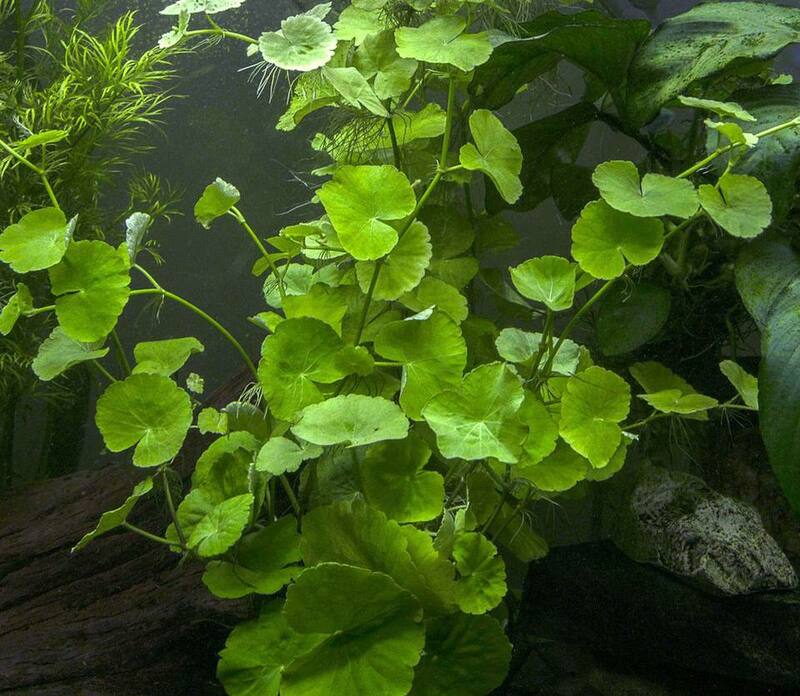 Brazilian pennywort (Hydrocotyle leucocephala) in freshwater tank. Hydrocotyle leucocephala, or Brazilian Pennywort, originates from wetlands and marches in Southern Mexico to Northern Argentina. Named after its penny-shaped leaves, it is widely available throughout the aquarium industry. The round, dime to half-dollar sized leaves growing alternately along a vine-like creeping stem, makes the Brazilian Pennywort great contrast plant in a live planted aquarium. At each leaf joint the plant sends out small white root shoots, and when the plant reaches the surface of the water it will produce tiny white blossoms. A rapid grower, Brazilian Pennywort quickly reaches eight inches or more in height. It is one of the easiest aquarium plants to grow and is suitable for many aquarium setups, from fully aquatic to bog settings. Brazilian Pennywort is very similar to another marsh plant, Cardamine lyrata (also known as Japanese Cress). The Japanese Cress has smaller leaves, while the Brazilian Pennywort is faster growing and less demanding. Healthy Brazilian Pennywort will grow a couple of inches each week, particularly when provided with ample lighting and plenty of nitrogen in the water. When nutrients and lighting is low, growth will be much slower. It can be propagated easily, by simply taking cuttings off robust plants. Brazilian Pennywort is particularly versatile, as it can be planted in the substrate or as a floating plant. When used as floating plant, it provides a perfect hiding place for young fry, as well as an excellent medium for infusoria to grow. It is not unusual for portions of the plant that are at the surface of the water to produce small white flowers. It can also be planted in the substrate, where it makes a great mid or background stem plant. If weighed down, it can be trailed across driftwood or other surfaces. When used as a stem plant, it looks particularly attractive in bunches of a half dozen stems of differing heights, placed together. Regardless of how it is planted, Brazilian Pennywort will grow towards the surface, the lower leaves dropping off as the plant gets taller and shades the lower leaves. Brazilian Pennywort can also be used as a bog plant in paludariums, and will flower regularly above water, as long as sufficient humidity is maintained. Another interesting use of this plant is seen in the tropics, where it has been used as a medicinal herb. The edible plant has also been used as a spice; the leaves reportedly have a peppery flavor. Brazilian Pennywort does well in a wide range of water hardness and temperatures, as well as most lighting situations. Optimum growth occurs in warmer temperature, as well as at higher lighting levels. When lighting conditions are low, it will grow far more slowly. When iron is low, the leaves will turn yellow at the edges. Overall growth will be slower, and leaf size smaller when nutrients are lacking. Very soft water tends to slow growth, while harder water promotes lush growth. Brazilian Pennywort grows best when provided with nutrient-rich water, carbon dioxide, and high lighting conditions. However, it will continue to grow even when those factors are in short supply. Which Loach Species Is Best for Your Aquarium?